Our Employment Tool Kit was designed to help you research, find and keep employment in the competitive labor market. Stories, tips and resources were developed from a collaboration of people, including adults with autism, dedicated to increasing the employment participation of adults on the spectrum. Download the kit and begin your job search! TheSpectrumCareers.com: a tool for job seekers with autism and the business community! Autism Speaks, in collaboration with Rangam Consultants Inc., launched this jobs portal to promote inclusive employment of people with autism. This free tool helps to match job seekers on the spectrum with businesses, as well as with local employment service providers (i.e. supported employment agencies and job coaches). Read more about the web tool here, and then sign up today! It can be hard to find out which companies are taking steps to hire and support people with autism. 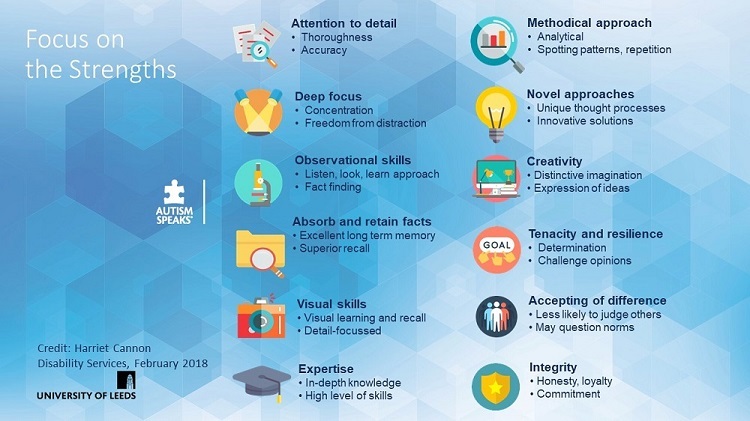 Autism Speaks is in contact with the employers who are leading the "Autism at Work" and broader neurodiversity movements, as they create proactive hiring initiatives. Check out the list below of companies that are public about their efforts to hire people with autism! For people with autism, a common concern when considering work is the possibility of losing one's benefits. Autism Speaks developed the video below and frequently asked questions to ease your concerns and help you on your search for a job that is right for you. What is a Vocational Rehabilitation (VR) Agency, and how can it help me? Each state has a Vocational Rehabilitation (Voc Rehab or VR) agency that provides employment service supports to people with disabilities (including autism). VR is paid for by the federal and state government, and you might be eligible if you apply. It is available in every state to help people with disabilities prepare for and obtain jobs. In big cities there may be several VR offices, whereas in rural areas there may only be one office that serves many counties. What kind of services can I get from VR? Exploring an option for starting a small business. Find your state Vocational Rehabilitation (VR) Agency here. The Autism Speaks Employment Think Tank was an intensive two-day meeting of people with autism, service providers, and businesses. The discussion focused on the role of adults with ASD in the workforce and on the needs of the current labor market. Key conclusions include insights from business leaders about the effectiveness of employees with autism and recommendations that include changes to the traditional job interview.